NYC, 05/22/2019, 7:00PM. 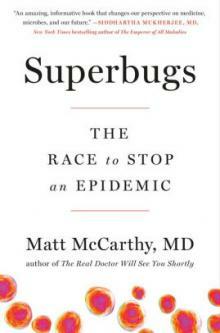 Superbugs: The Race to Stop an Epidemic. Physician, researcher, and ethics professor Matt McCarthy is on the front lines of a groundbreaking clinical trial testing a new antibiotic to fight lethal superbugs, bacteria that have built up resistance to life-saving drugs. Can Dr. McCarthy save the lives of his patients infected with the deadly bacteria, who have otherwise lost all hope?